How can we show children we love them even when they push us away? How do we make children more resilient when they are angry, self-harming, anxious, abusive or delinquent? In this story-filled presentation, Dr. Michael Ungar provides nine practical strategies parents, caregivers and educators need to help young people of all ages heal, no matter a child’s emotional, psychological or behavioral problems. For many of us in the serving professions, our professional lives may have started out with a deep inner calling. We may have held onto a sense that our occupation was also our vocation. However, as we continued to serve and lead in a variety of roles, staying connected to this calling and sense of inner purpose may at times have become challenging. Breathing and Embracing: What Does Mindfulness Have to Do With Resilience? Mindfulness means “Paying attention in a particular way: On purpose, in the present moment, and nonjudgmentally” (Kabat-Zinn). The field of mindfulness-based interventions for adolescents is currently exploding. Emerging mindfulness-based interventions for youth are showing significant promise in helping adolescents to cope with adversity, and promote resilience and positive youth development. What Does it Mean to be "At Risk"? What are the processes and mechanisms that promote or prevent risk? 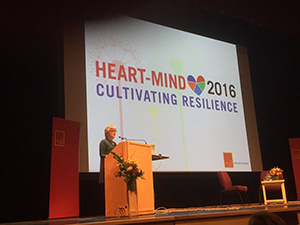 Heart-Mind 2016: Cultivating Resilience took place October 21-22 at the Bell Centre for Performing Arts in Surrey, British Columbia. As a conference dedicated to helping the adults who teach and care for children, this year was focussed on one of the key positive human qualities that promotes Heart-Mind well-being: resilience. Over the two days, over 650 attendees from all over the BC and from as far away as Brazil and the Netherlands - the largest audience to ever attend a Heart-Mind conference - participated in keynote presentations, workshops, musical performances, Connect and Reflect breaks, and mindfulness activities. 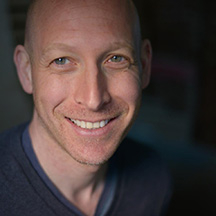 Eli Puterman is a health psychologist and assistant professor at the University of British Columbia in the School of Kinesiology. He has advanced an innovative model of resiliency that suggests that physical activity and other healthy behaviours can mitigate the negative biological impacts of life course adversities. He has published extensively on how stress can affect us and the benefits of living an active life — and demonstrates how this can help us to be more resilient. What first inspired you to focus your research on the topic of resilience? Based in Vancouver, Canada, Shelley Moore’s research interests integrate the theory and practice of inclusive education, special education, curriculum and teacher professional development. She is particularly interested in how students of all abilities can be included meaningfully while also contributing to the learning of their peers.